With the jailbreak having recently arrived for iOS 7, all of those tweaks made famous throughout the last few releases of the Apple mobile ecosystem are being frantically updated. Today it’s the turn of TetherMe, a popular hotspot app for iPhone and iPad, and as well as now offering full compatibility for iOS 7, it has also been boosted by support for the new 64-bit A7 processor based devices. Although the iPhone and iPad does offer ‘Personal Hotspot’ access as a native feature, some carriers like to deactivate it, preventing users from using their cellular data for tethering purposes – until you pay them to enable the feature. But with TetherMe, a tool that essentially overrides this limitation, you can set your hotspot up exactly as you wish, and since this even works on older devices right the way back to the iPhone 3G, it may even be worth digging out your antiquated handset from the dusty drawer and using it as a makeshift Mi-Fi. Having used TetherMe on an old iPhone 3G for quite a while, it has always been completely reliable, and as well as Wi-Fi, you can also readily tether through Bluetooth and USB – as per the stock offering. Please note, however, that if your carrier has disabled tethering because you’re not permitted to use it on your current deal, then you must read very carefully. Many network operators have been known to automatically upgrade the service plans of those caught tethering without warning, and what’s more, you could incur sky-high additional charges depending on which company you do business with. 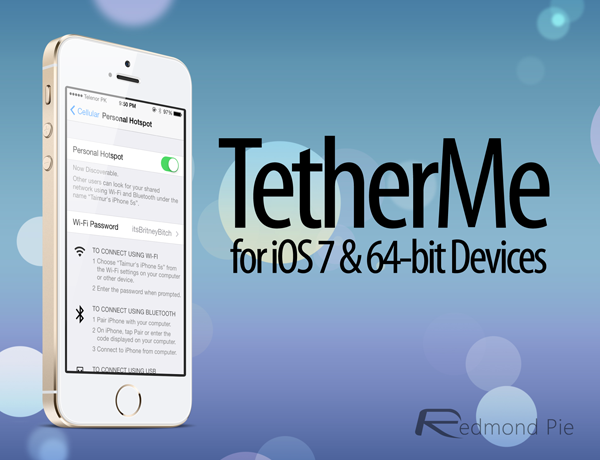 TetherMe works with iOS 4 through the latest iOS 7 thanks to the update, and costs $4.99. In my opinion, TetherMe is the go-to app for those looking to tether on their iOS device, and for a cent shy of five bucks, is definitely good value for money. 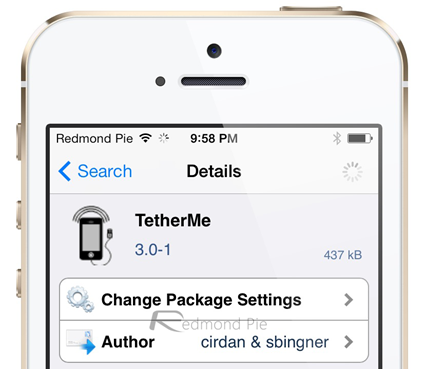 You can source TetherMe over at the BigBoss repository, which will be in your default repo list provided that you haven’t opted to manually remove it. Simply hit the Search tab in Cydia, type in TetherMe, and after a reboot, you’ll be good to go! If you’re looking for an alternative, then be sure to give MyWi 7.0 for iOS 7 a shot too. So this is only good for carriers that don’t already allow your phone to be a hotspot or older ios versions?